A fat tyre bike is designed to handle the terrain that a normal bike can’t, taking adventurous riders out onto snow on mountain trails in the winter and sand on desert and dunes in the summer. It should give more freedom to riders, especially a unisex model like this with an apparently high end specification. But, are rides happy with what they receive here? What benefits have buyers seen when testing out this VooDoo Fat Bike? It is all about the wheels with a good fat bike, as this is the only way that this all-terrain adventure bike is going to get through all that mud, snow and sand. Here Voodoo have added Veerubber 26″ x 4″ tyres for off-road traction, providing the ideal surface area. There are many riders that are impressed with the quality of the tyres and wheel and the way they handle. Some experienced riders have let down the pressure a little for a better response, but first timers arenâ€™t exactly struggling. There is also a strong need for control here on what are unusual, difficult surfaces, this is why the makers have added a rigid fork, and a good braking system with the Shimano hydraulic brakes. In addition to this, there are the added benefits of the range of speed on the 16 Shimano gears and the lightweight frame. This is great for carrying it in those moments where the snow drifts and dunes can get a bit too much. Are there any flaws to this VooDoo Wazoo Fat Bike that limit its ability in these tough areas? There are a number of reports from users that have taken this VooDoo mountain bike and fine tuned it with new components to make it that little bit better. This isn’t so much a criticism of the full specification, but rather a chance to customise the bike. This does add to the cost, but keen fat bikers seem happy to pay out. There are also some that aren’t that impressed with the simplistic design and colour scheme, wishing that it stood out a little more. But this muted look is perhaps to be expected from a unisex option. Summary: what does this all mean for a final verdict on this VooDoo Wazoo 26′ Fat Mountain Bike? There are lots of buyers commenting on the fact that this fat tyre bicycle allows them to go to more places than they could before, essentially opening up a new type of riding. At the same time, there is some familiarity to the components that mean that it is all fairly intuitive. 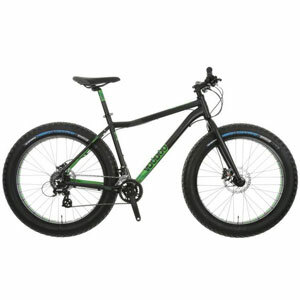 There are lots of buyers getting a lot of enjoyment out of the VooDoo mountain bike and appreciating the style and basic components. Some will want to upgrade it and work with it, but for many this is actually part of the fun. 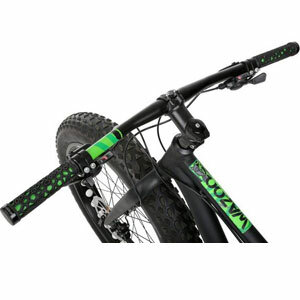 Find more reviews about the VooDoo Wazoo Fat Bike on Halfords here.